This is my family favorite BEST cream cheese frosting recipe! It goes great on Carrot Cake, Red Velvet Cake, and just about any other flavor cake or cupcake you can imagine. 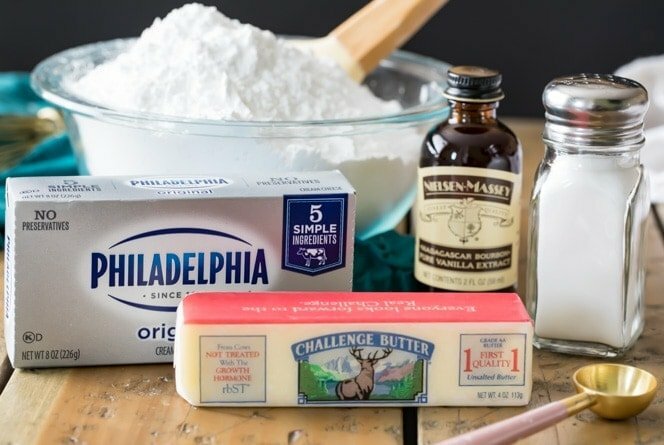 I’ve been making this cream cheese icing for years! 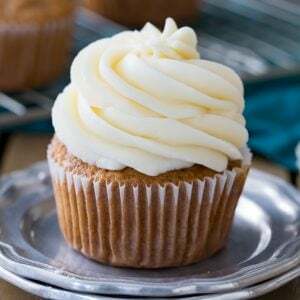 If I had things my way, every cake and every cupcake would be be buried beneath a mountain of cream cheese frosting. Not buttercream — Never rarely buttercream — always and only cream cheese. For someone with such a rampant sweet tooth, it’s alarming the number of times I’ve turned down a slice of cake or a sky-high frosted cupcake because the buttercream just makes my teeth hurt (OK full disclosure I have a buttercream recipe coming up on the blog next month, and it’s delicious, but cream cheese frosting will always win over my heart, even over my favorite chocolate frosting). While buttercream frostings are usually too sweet, cream cheese frosting I could eat with a spoon, and this recipe is every bit as versatile as buttercream — it’s sturdy, pipe-able, can be dyed, and, most importantly, it’s delicious. Make sure that you are using full-fat brick cream cheese, not low fat or spreadable cream cheese (which is usually sold in a tub rather than in brick form). I always like to use unsalted butter and add a dash of salt so that I have complete control over the flavor of the frosting. However, if you only have salted butter on hand then just omit the salt called for in the recipe. 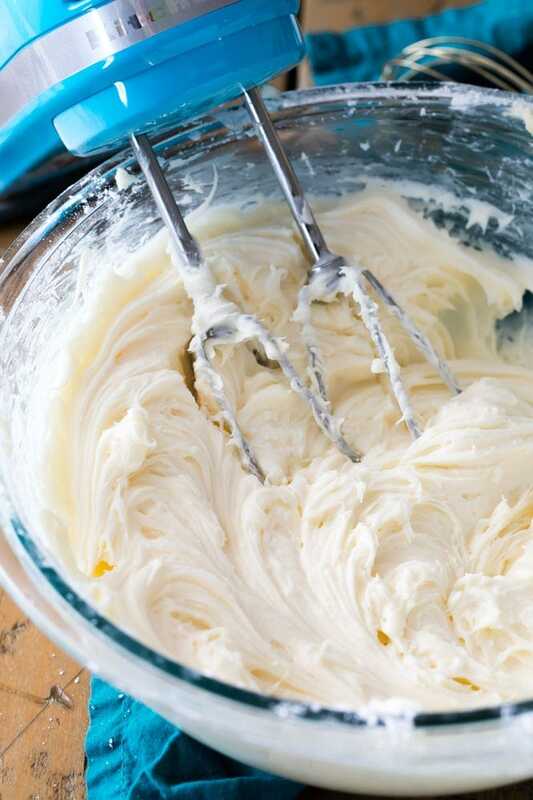 Make sure you allow your cream cheese and your butter to soften before making your frosting! Softening the butter and cream cheese ensure that your ingredients will combine well and be lump free. If you intend to pipe your frosting, I recommend sifting your powdered sugar before mixing it into your butter/cream cheese mixture, as small lumps of sugar can clog up your piping tips, especially if you’re using a smaller tip. Can cream cheese frosting be used for piping? Yes! Especially with this recipe because it is nice and thick. Now, this frosting (as with most) is prone to melting in hot weather, but it pipes nicely and as you can see in the photos it holds its shape neatly as well. What I love about this recipe is that it already makes a nice thick frosting, but if needed you can add more powdered sugar to make your cream cheese frosting even thicker. I recommend adding about 2 Tablespoons at a time until the desired thickness is reached. Alternatively you can add cornstarch… see more on that below. 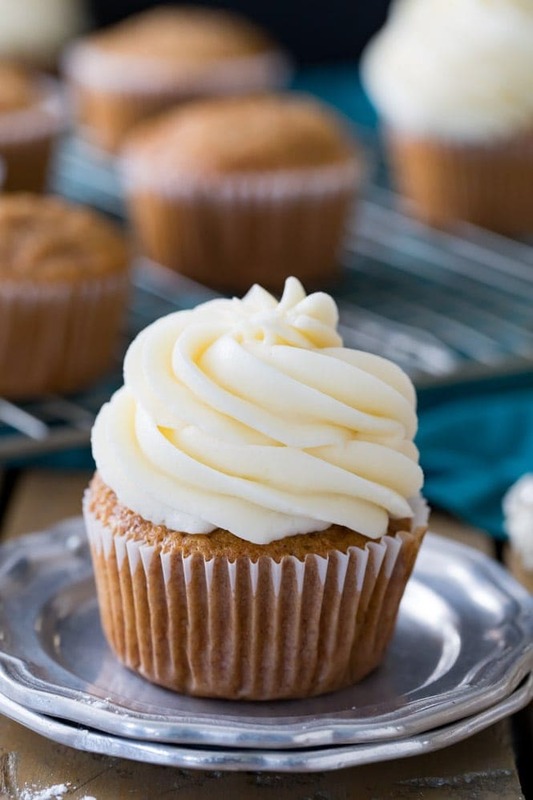 Can I add cornstarch to my cream cheese frosting? Yup! While this recipe does not call for it, if you need a particularly stiff frosting or are looking to make your frosting thicker without making it sweeter, you can add cornstarch (in fact, I use this technique for my carrot cake cookies). I don’t recommend adding more than a few Tablespoons, so start with just one Tablespoon at a time until desired thickness is reached. 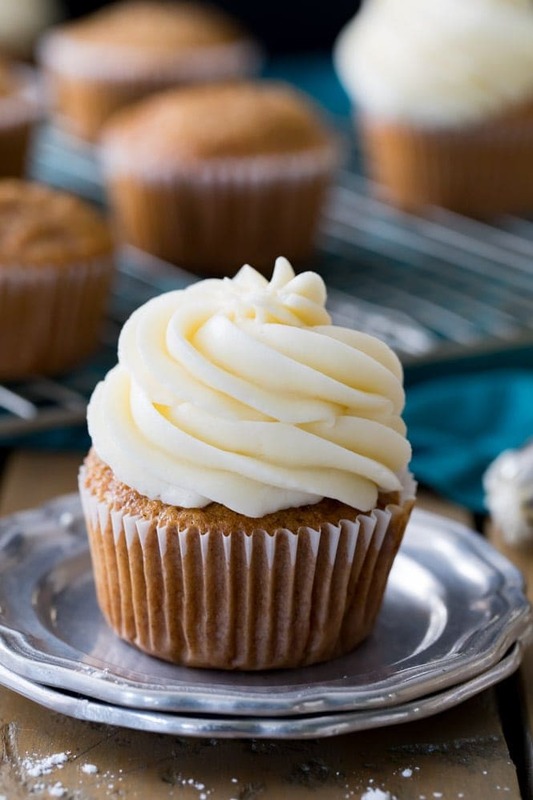 Alright, while (in my humble opinion) cream cheese frosting goes great with everything, there are certain cakes and cupcakes that complement it particularly well. Wednesday I’ll be sharing one of my favorite cupcakes with you — the exact cupcakes seen in the photos above. Can you guess what flavor they are??? This is my all time FAVORITE Cream Cheese Frosting Recipe! Just 5 ingredients! This recipe will cover either one 2-layer 8" or 9" cake, 24 cupcakes, or generously frost (as much frosting as in the photos) 12 cupcakes. Combine butter and cream cheese in the bowl of a stand mixer (or you may use an electric mixer) and beat until creamy, well-combined, and lump-free. 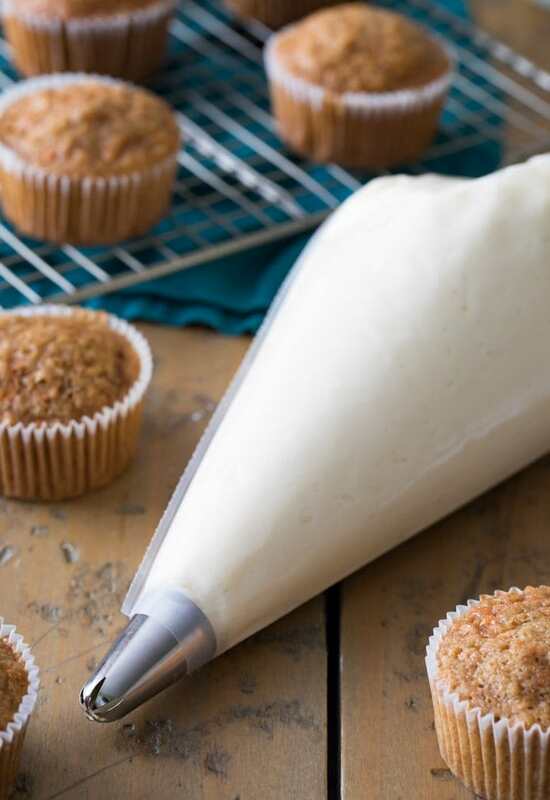 Use to frost completely cooled cake or cupcakes. *If you plan to pipe the frosting with a small tip, I recommend sifting the powdered sugar (after measuring). The cupcakes in these photos were frosted using an Ateco 848 tip. Hi Sam, Can you please advise me if unsweetened cocoa, would be good to use to colour the frosting little brown, as I don’t want to added anymore sweetness. Hi Michelle, unsweetened cocoa would make it brown, but it will also make it taste like chocolate so just keep that in mind. I do have a chocolate cream cheese frosting if you’re looking for one. loved this recipe! finally found the perfect cream cheese frosting. I love cream cheese frosting! And I have a penchant for piping this icing onto cupcakes using all kinds of colors! I don’t beat my butter and cream cheese together ever. I do butter first for about 3 minutes on low using a hand mixer rather than my stand mixer. I just find it easier to “feel” when the consistency is just right. Then I add the room temperature cream cheese and carry on to adding in sifted icing sugar a half cup at a time. 2 tsps of cornstarch diluted in a LITTLE milk can help stiffen the icing if it won’t hold its shape the way you’d like. I’m a long way from being an expert baker or chef but I have figured out frosting!! What type of cream cheese brand do you recommend? Is Philadelphia cream cheese in the foil okay? Can I add different food colorings to it to? Hi Tracey! Did you use the brick-style cream cheese or the spreadable kind in the tub? It has to be the BRICK STYLE to support the thick consistency of the frosting and the integrity of the cream cheese flavor. This recipe is perfect explained and it turns so well for the cupcakes, I made it the night before and left at room temperature, so well, thanks for sharing it. I made extra , how long it can be in the fridge to be able to use it? If you use this to frost cupcakes, does it need to be done the same day you are serving them? If I make a day ahead of time, does the frosting need to stay refrigerated or will it be ok on cupcakes sitting overnight? Thanks! Where I live in Sweden I can’t find the bars of cream cheese, only the soft spreadable kind. Is there anything I can add to be able to use the spreadable cream cheese successfully? I’m looking for enough frosting to use for a 3-layer cake, and it will be between the layers, as well as the entire outside. Will I need to double or 1.5x this recipe for that amount, you think? This tasted delicious! I added lemon instead of vanilla. It didn’t hold up too well in our Aussie heat as it just slid off the cake but it was over 100 degrees (38 degrees) so I don’t think anything was going to!